…came to a nearby town to present a workshop. I was a little surprised at the time by how quickly I Responded, since the town was far enough away that I would normally have had to work fairly hard to convince myself to make the trip. In a completely unconnected process, the week before Jeremy’s workshop, one of my clients asked me to attend an all-day meeting being held the day before the workshop. My client’s meeting was to occur in another town only a few miles from the workshop, and they offered to provide lodging before and after the meeting. Tremendous stroke of luck, as it meant that I didn’t have to get up before dawn to travel to either! As my client was making these arrangements, they suggested I bring my wife and have a “second honeymoon.” Well, unbeknownst to my client, it turned out that the meeting was happening in the same hotel that our wedding reception had been held in years before! Another remarkable coincidence – or remarkable Intuition on the part of my client. So, we went to the meeting and the workshop, and assisting Jeremy in the workshop, unbeknownst to me when I signed up, was a friend, remarkable person, and fabulous Irish Harpist, Peter Berry (https://manufacturing.dustystrings.com/blog/dusty-harp-001-interview-peter-berry). Well, Peter, with his Harp and his incredible Bardic Genius for Story, was the officiant who married us! Not knowing these remarkable “coincidences,” Jeremy sketched out the Sidhe way of relating to their Reality, which sounded a lot like what we might Call 5D Manifesting, where we’re in Cooperation and Collaboration with the Energies and Forces around us. That’s one of the fundamental purposes for this blog, hoping to help us understand the Forces swirling around us at any given time, so we can more Easily Cooperate and Collaborate. I don’t normally get this personal in this blog, but the Story is too “coincidental” to resist telling. Back in 2012, when the World As We Know It was Ending, we spoke a lot about how a New Energy Manifests at the Beginning of a Cycle between two planets, when a faster planet passes a slower one, and the slower (more Powerful) planet Initiates the faster one, or provides Shaktipat so that the faster planet can serve to Implement the Program of the slower one. After the Initiation – when the New Energy is Prominent, the New Energy moves underground, as the Masters of the Old Obsolete Energy work to save their Investments by Forcing the Old Energy to appear to still be Working. If we understand these Cycles, and know where we are in which Cycles, we can ignore the Old-Energy-serving headlines, we can “no longer lend our Strength to that which we wish to be Free From” (as Jewel puts it), and put our Efforts into helping the New Energy take hold. The New Energy comes into its own when the faster planet is three Signs ahead of (“Waxing Square to”) the slower planet. In 2012 Uranus Waxed Square to Pluto, finally bringing the Energy of the 1960s (when Pluto Initiated Uranus) out into the mainstream. We Intuit the nature of a Cycle first by the nature of the planets involved, then by the Sabian Symbol of the Degree in which the Initiation occurred, and third by the Birth chart of the Initiation. One meaning for Pluto is Transformation, or Trance Re-Formation, and another is Compulsion. The interpretation we use for Uranus is the Individual Soul. So the 150-year-long Uranus-Pluto Cycle is about a Compulsion to Transform our Lives so that our Ego Identifies more with our Soul or Mission. You’ll notice that we talk about that quite a bit, especially now that Uranus is Edging into Taurus (Soul Merging with Flesh), which it does again in about six weeks. The Sabian Symbol for the Pluto-Uranus Initiation was “A Ouija Board” – Opening up to the Mysterious. The chart of the Initiation is quite remarkable (https://astrobuss.wordpress.com/2016/05/29/yintegrity-in-public/). So I was thinking last week about how I should be giving examples of the Waxing Square stage of Cycles, where the New Energy is coming out of the Closet, and see if we can Relate that to the Initiation, which we more often write about. So this evening I looked to see which Cycles were at the Waxing Square, that we could write about, and lo, Mars was Waxing Square to Saturn just last week, on 21 January. So, when was the Initiation, and what did we write about it? I’m not trying to make this a test or testament about these methods, as I didn’t invent them – blame Dane Rudhyar for that – because, after having seen these methods work over the last half-century, I know that if I don’t understand, it’s because there’s New Information coming into my Consciousness, and it’d Behoove me to Pay Attention! We Interpret Saturn as “The Most Important Thing” or the First Priority, and Mars as Action. So the Mars-Saturn Cycle would be about how well we Prioritize our Actions, and whether they Further our Goals. We have the admitted Bias that we Believe our Goals (at least while Uranus is as Lit Up as it has been) should be devoted to Opening our Ego to Adapt to Knowing and Surrendering to our Soul. “If we were examining Projects we’re beginning now (this Rebirth, for example), and hence using larger Sensitivities, we’d see that the Saturn-Mars Initiation is also Merged with the Quaoar and Pholus Stations. “So ‘you who philosophize Disgrace and criticize all Fears, take the rag away from your face, cuz now ain’t the Time for your Tears,’ as Bobby D put it. God/Goddess is on our side after all. It’s been a tough week, but the prognosis is good. “The light lines show that the impending Saturn-Mars Initiation T-Squares the Full Moon, but Trine-Bridges the Decisions-about-Abuse-and-Privilege central axis of the Yin Gate. Which is to say that if we Act to Be Responsive to our Survival Instincts, and by extension to our Hidden Genius, it will Heal our Abuse Histories Paradoxically. We didn’t discuss, at least in that post, the Yin Gate with its emphasis on the Orcus-Nessus Opposition as the Primary Paradox governing the Cycle. Orcus symbolizes the Oaths, Promises, and Commitments that are Forgotten and become Obsolete Habits, aka Karma, and Nessus symbolizes Abuse and it’s flip side, Privilege. One very common sort of Paradox is the Healing Crisis, where an Affliction gets worse after a Healing before it gets better, and may continue to get worse if we Distrust the Medicine, because our Afflictions are continuing Mirrors for our Attitudes. Here in the USofA we’re in the role of the Battered Woman, where our Oaths to Support Nation and Authority, and to curry favor from Wealth, are being tested by the fact that Authority and Wealth have been Abusing their Privilege and in the process Abusing Us – and we’re Noticing! The two diagonals of the Yin Gate (the blue Rectangle) are the Journey from Karma to Mission, including the “fact” that our Karma hides the tools we need to Reach our Mission (the Nodal Axis), and Noticing that we need to Trust our Instincts about Ending Obsolete TimeLines (Sun-Mercury Opposite Moon-Eurydike-Atropos). My own Obsolete TimeLine that’s being Ended is my Programmed Resistance to Accepting the HardCopy Reality of the Subtle Realms and Other Dimensions, where the Energies we need to Cooperate and Collaborate and Conspire with are Swirling, in and out of our own Dimension. Even though I’m Passionate about Reanimating the World and All of its Beings, Sentient and Otherwise (if there is such a thing as an Other-than-Sentient Entity), how much do I Allow it to interpenetrate my Life, Moment-to-Moment? Earlier in https://astrobuss.wordpress.com/2018/04/01/surviving-2/, we point out that the Saturn-Mars Initiation is also Merged with (Conjoins) the Belief-Responsibility-Survival (Vesta-Pholus-Quaoar) Stellium, telling us that in order to Act to Support the Most Important Thing, Respond to our Survival Instincts, and Allow the Angel’s Harp to Enchant us into Collaboration and Cooperation with the Energies Swirling around us, we need to Allow our Beliefs to Shift. I have not been Working to Shift my Beliefs; I’ve been Reading and Learning and Watching them Shift on their own. If we look at the second chart in https://astrobuss.wordpress.com/2018/04/01/surviving-2/, we see that the Belief-Responsibility-Survival-Action Challenge (the red triangle or T-Square) is Self-Resolving (the blue cat’s cradle across from it the Diamond Star created by Varuna and Pallas), and that the Belief-Responsibility-Survival-Action Challenge itself is actually between our Ability to Manifest (Makemake) and our Victimhood or Attitudinal Adeptness (Chiron). Now, while all that well describes the Roots of the Cycle, we want to Recognize that it’s Evolving. If we look at the chart of the Waxing Square itself, which is almost identical to the Sappho-Station (Self-Love) and Grand Octile (Epiphanies) Total-Lunar-Eclipse (Erasing our Karma and Enhancing our Vitality) charts in the Self-Judgment and Self-Love series (the previous posts), we see that our Understanding of the Most Important Actions for us to take (the Mars-Saturn T-Square) is being Transmogrified (Bee-Zed) by our New Commitment to Self-Sovereignty (Hylonome) and our Learning that we overcome our “Fate” by simply Choosing an Alternative (asteroid Moira). All of which leads us to https://www.instagram.com/p/Bs__j4Zgw8v/. We have dedicated our Lives to suppressing certain Emotions and Memories and even Thoughts, and for good reason. They would Overwhelm us, and we have More Important things to do. Till now. Thing is, those Emotions and Memories and Thoughts are the doorways to Healing our Limiting Beliefs, making it Safe to Remove our remaining Masks, eliminating Self-Sabotage, uncorking our Forbidden Genius, and to painlessly achieving the Yintegrity and Self-Sovereignty that we so crave, but which we hold back from because we fear it would so Disrupt our Lives and the Lives of those we Love and Depend upon. That sentence was not approved by the FDA, but I believe it’s True. And it may even positively impact our Physical Health. The Universe will bring these Emotions and Memories and Thoughts to us in early June, and the Universe has been, and continues to, give us Opportunities to get a head start. And every early Opportunity we take advantage of will make June less painful. If we’re still in Resistance to these Emotions and Memories and Thoughts in June, the process could well be painful. The Universe is our friend, if we Learn to listen to Her. When an Angle between two planets repeats, as is usually the case with outer planets, the first event always catches us off guard. The last time this event occurred was in 1926, so very few of us have Experienced it in our current Lifetime. If you know someone in their 90s who’s freaking out, this is probably why. The less Experience we have with an Energy, the more likely it is to catch us off guard. Forewarned is forearmed, however, so even if we’re off guard, knowing in general what the Energy is about can help us make sense out of what’s happening, and can help us step out of the Victim Modality we’d otherwise be in. Let’s take what we hope will be an extreme example – suppose we were sexually abused as a child. We don’t remember it, we only notice that in some situations we feel Unsafe or Angry or Scared, or maybe we’re uncomfortable with Intimacy. If those Memories pop up in late May or early June, we’re going to Regress to the age when the abuse occurred, and to the Skillset and Boundaries that we had – or more accurately didn’t have – at that age. Victim Modality is a foregone conclusion, most especially if those Memories arise as a result of some similar-feeling Unsafety in the then-Present Moment. If we are somehow reminded that there is likely to be a “100-year” Regression (a Regression on such a scale that it occurs only once in a century) going on, we’re still going to be caught off guard, but we’re likely to be able to Recover our Present-Moment Skillsets much sooner than if we didn’t get the memo, or as the case may be, the blog post. We’ve talked before about “Sensitivity” – how Sensitive we are to an astrological event, something astrologers can “Orb,” and I sometimes call “Slop.” When an event is pending, most folks can certainly begin feeling it when it comes within one Degree of being exact. Of course the Muggles will be in Denial, finding all manner of excuses, thinking it’s Heartburn. The more Sensitive among us will begin feeling an event when it comes within three Degrees. The most Sensitive of us will feel it sooner than that. An Initiation is a Conjunction. When Angles repeat three times, as the Uranus-Eris Conjunction does, the first occurrence is a Can-Opener. It opens a “Can of Worms” that we didn’t know was waiting for us. The second and third occurrences are also Conjunctions, but they aren’t Initiations – only the first event is an Initiation. We’re almost always in Victim Mode during a Can-Opener. The second occurrence is an Exposition – the same Energy recurs front and center, but this time it seems to occur in slow motion (Retrograde), so we have a far better chance of understanding what’s happening “to us,” and consequently a far better chance of moving from Victim Mode to Master Mode. In Victim Mode things happen to us, we have no Control over them. In Master Mode, even if things happen to us, we have Skills to deal with them adequately. If we Master an Energy during the Exposition, then the third occurrence is a Confidence-Builder. The Energy and Process recurs, but this time we’re ready and able to deal with it using our now-Present-Moment Skillsets, including those we learned in the previous two events, and we sail through it, feeling great about our new Expertise. If we didn’t Master the Energy during the Exposition, then the third occurrence becomes another Opportunity, another Exposition. The Uranus-Pluto Square recurred six times after the Can-Opener, giving us an indication of how Important the Universe thought it was for us to Recover our Yintegrity. As if Pluto didn’t already symbolize what is Mandatory (Adaptable but not Avoidable). The Can-Opener (June 2012) was followed by five Expositions (October 2012, May and November 2013, May and December 2014) before the Confidence-Builder (March 2015). The Uranus-Eris Exposition peaks in late September, while the Confidence-Builder occurs at the Ides of March next year. In other words, as Uranus approaches Eris, that section of the Zodiac (now 21-23 Aries) gets very Hot. The Sun (our Essence) crossed that section last weekend (April 9-11), while Varuna (Cellular Wisdom) and Chariklo (Beauty and Charm) were Stationary. Venus (our Values) crosses that section two weekends hence, April 22-24. In between, this coming weekend (April 16-17), Mars (Action) and Pluto (Inevitability) are Stationary (Strong). It would be really appropriate to Mars-Pluto – and fortuitous – if such Freudian slips came out this weekend, because they would constitute bright flashing lights pointing us toward clues about what hasn’t come to the surface of Consciousness yet. Let your tongue be your Guide this weekend. Same with “slip-ups” of any sort. Make a wrong turn on the way to the store? Where did you end up? Drop a jar of Honey on a hard floor? What do you suppose that might mean? PIAVA the question. Run into someone you haven’t seen in a long time? A stranger strikes up an interesting conversation? Pay Attention this weekend. Our Unconscious Limiting Beliefs are Burning their way out of Denial now, and will be for the next fifteen months, while this Mercury-Vesta Cycle moves through. Just long enough to cover the Eris-Uranus Confidence-Builder. We’ll talk more about the Vesta-Mercury Initiation – with its two Tricolors and Grand Trine – in the next installment, but note that while it’s occurring, the Sun is crossing the asteroid Mnemosyne – Memory. What a jokester, this Universe! Sagittarius and Scorpio. Believe it or not, the Sagittarian Wisps are actually Crystals, of Natrolite, sitting on a more recognizable Crystal, Scorpionic Apophyllite. Nevertheless, things are still not what they seem to be. 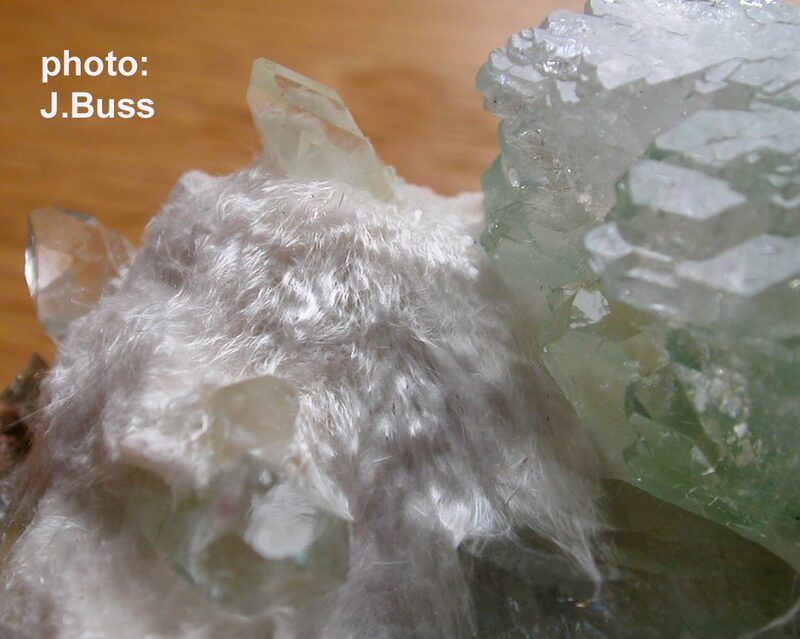 The recognizable Crystal is actually a Mica, Apophyllite, even though it looks nothing like a Mica. And the Wisps are actually a Zeolite, even though they look nothing like any we’d recognize. A Zeolite is a complex Mineral with pockets. You wouldn’t think there’d be room in those Wisps for a pocket, let along a complex Mineral. If you get the right Zeolite, you can dump it into a toxic mess, and the Zeolite will pocket the toxins and bring them out! I know, She is truly amazing, especially when we forget She’s a Living Entity with many orders of magnitude more cleverness than we’ll ever dream of mustering! Apophyllite (Potassium Calcium Fluoride Mica) is about Opening our Third Eye, appropriate for Getting to the Bottom of Things. Green Apophyllite brings Compassion into our Intuition. As we like to say, Apophyllite was used for Divining by the twelve Apophylls. Natrolite (Sodium Aluminum Zeolite) is about Opening the Crown Chakra, appropriate for Letting Go of what Limits us. Like much of the loveliest Apophyllite, this one comes from near Pune, India, a center for many different flavors of Spiritual pursuit. Friday the 13th falls on a Saturday this month, as Pogo used to say. Whatever you’re Grieving, Trust that it was not planning to be part of the next phase of this Gaia-Pi Adventure. We’re in the process now of Co-Creating what we need for the next phase. Mercury and the Balsamic Moon rise ahead of the Sun, so they should make a lovely couple just before Sunrise, whether you’re in the right spot (east central Asia) to see the Moon cover Mercury or not. The Balsamic Moon is about Letting Go, echoing our other themes. we can – appropriately – be pretty obsessive. Another useful key phrase about Scorpio, left over from the Recovery Movement in the 1980s (when Pluto was in Scorpio) is The Way Out Is Through. Saturn has been in Sagittarius since Christmas 2014, and in Sagittarius The Way Out Is Letting Go. So we’ve Lightened Up quite a bit since Christmas. But there are still some bits of Egg clinging to the pan, so we need to go back and scrub a little more. Till last Christmas, Saturn had been in Scorpio since October 2012 – in other words, The Most Important Thing has been Getting to the Bottom of Things since Time ended and Pi took over. For the last two and a half years The Most Important Thing has been locating anything and everything that has stood between us and taking Full Responsibility for Everything in our Lives. Though Pi gave us that first nine months of Grand Trines to ease our Rebirth into the New Era, of course that would feel like being poked with spears and knives by everyone and everything around us, as we were educated about where we weren’t taking Responsibility. Soooo, what did we not quite finish up? Responsibility means being able and willing to Respond. It looks to improve the Future, not assign causality and Blame for anything from the Past. Anyplace in your Life where you’re still feeling like a Victim, or where you want to Blame someone else for anything? Those are the bits of Egg we need to work with; keep your eye out for them between now and mid-September, especially toward the end of July, as Saturn turns Direct on August 1. After mid-September, we’re in the Let-It-Go Stage “for good” – well, for two and a half years anyway. Sure, Narcissism can feel like a pain if we’re stuck with having to deal with someone else’s Narcissism, but that’s just about our own unwillingness or inability to set working Boundaries. Our own Narcissism? Not to worry; it’s its own best frenemy. A caution for Virgo, though. Since Ego-Recycling and Virgo are so poorly understood in Ego-dominated Western culture, Virgo ends up being seen as nit-picky and critical, and Virgo grows up with a programmed self-hate from introjecting this criticality. So anyone with strong Virgo will likely worry about their own Narcissism. But Virgo is the Opposite of Narcissistic. What’s the Coin? Self-Love. Self-Transformation (Virgo) is about Self-Love, for sure. Transformation isn’t about hating what’s being Transformed, it’s about Transcending what’s being Transformed. A functioning Ego is flexible enough to Celebrate our own unique Skills fully – without having to compete them with the unique Skills of Others, and to Recognize when and where it would serve our Community better to delegate to the superior unique Skills of Another. A “normal” Ego, more concerned with how many strokes we get, gets stuck on the last hurt or triumph, and loses track of the Present Moment. This is what Virgo is about. Pisces is about making a break from a Community that we’ve outgrown, with all of the Grief and unfulfilled Wishes and lack of Recognition and unexpressed Angers and Fear of Abandonment that’s involved in Letting Go of a Community without the assurance that we’ll be accepted into a new one. Neptune and Chiron are working us through all that Drama and Trauma. Virgo is about making a break from a sticky Ego that we’ve outgrown, with all of the Grief and unfulfilled Wishes and lack of Recognition and unexpressed Angers and Fear of Abandonment that’s involved in Letting Go of an Identity without the assurance that a new one will function any better than the old one. Or, in a word, Ego Death. Makemake is helping us through this wicket, and it’s an excellent Guide to have, as its focus is always on Co-Creating the new tools we’ll need to Survive in a new Era. So as we go back into Getting to the Bottom of Things, we’re also back in Ego Death. With Saturn, we’re just re-entering our last review period (ie, just tiptoeing back into Scorpio and hoping she doesn’t wake up). With Makemake, we’ve already finished our review (ie, already backtracked into Virgo, and now we’re turning to exit for the final time), so we’re in better shape there. Between now and mid-July we’ll be making the adjustments that will “fix” the Responsibility shortcomings that we’ve already encountered. So while there may be a few Surprises awaiting us on the Emotional front, on the Ego front we’ve probably seen that last of them. Is it any easier to step aside and Witness an Emotion that threatens to overwhelm us, than it is to step aside and Witness an Identity that’s sabotaging us? You bet. It’s when the Emotion and the Identity are intertwined, that the greatest difficulties arise. And as we encounter the last few Emotions that Separate us from Joy and Light, we should already have some degree of Ego Detachment. Cuspal Saturn and Stationary Makemake are Sextile to one another, sharing the quality of Magnetism. Sextiles connect two Signs that have either Magnetism or Dynamism in common, so on this basic level they aren’t competing with one another. It’s the Sixth Harmonic, so the basic Energy is about Partnership – Win-Win. In our tradition of focusing on what’s being Healed, we’ll do just that, and propose that the current 33-year Saturn-Makemake Cycle is about Healing the lost art of Apprenticeship. In pre-Industrial society, as children we “played” at learning the “work” our elders were doing, automatically learning Survival Skills in the process. Since that link was broken by the various forms of Industrial Slavery (schools that removed children from parents so they could be propagandized into one paradigm, work that separated the workplace from the family so compassion could be removed from working conditions, etc), child-adult relationships have been strained and forced into unfamiliar forms. Are there concrete steps I can take right now, to integrate my Spiritual Life with my Everyday Life and What I Do to Survive? Have I already taken any steps like this? Can I start to build them into Patterns that can become the infrastructure of Life in the Next Phase?